Mundial Mundigrip knives feature high-carbon stainless steel blades, and a special polymer constructed handle that allows for extra grip - the handle is constructed of a soft enough polymer to provide extra grip (it is not a soft, rubber like handle, just a slight give under pressure). NSF Certified. 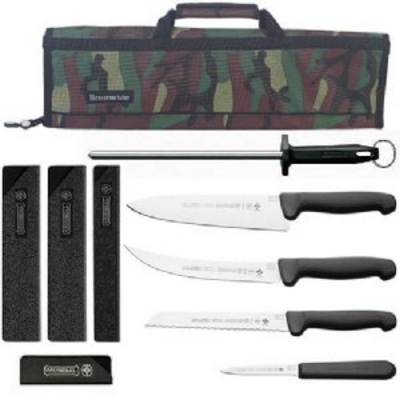 Includes: Camo Bag, 10" Polished Steel, 8" Chef knife, 8" Breaking/Trim knife, 7.5" Serrated Slicer, and 3.25" paring knife. Blade guards are also included. Mundial knives feature a lifetime guarantee against defects. 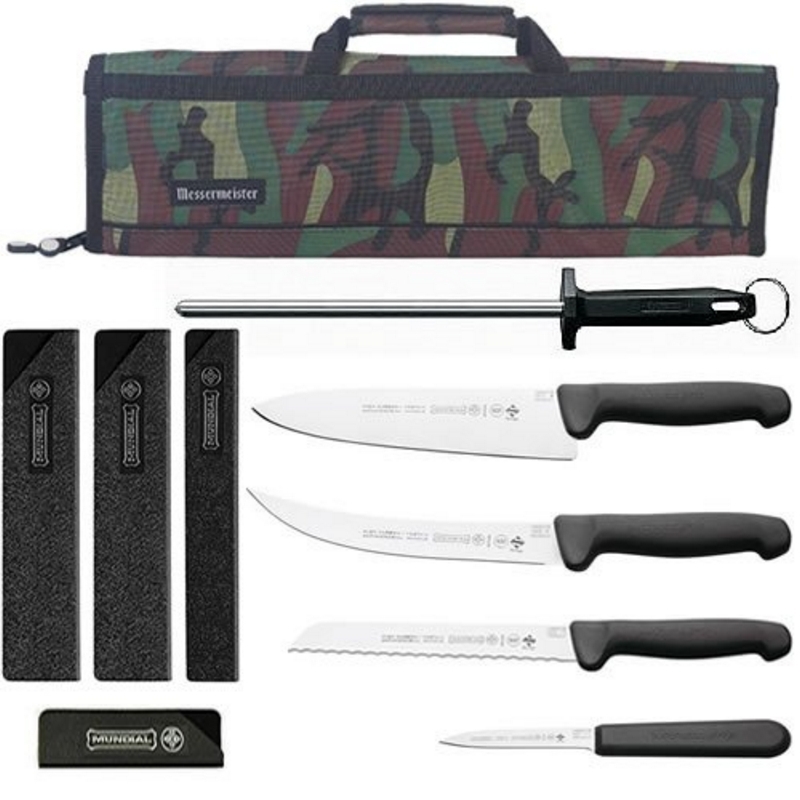 Set includes the most popular knives for use in the kitchen; by caterers, or to keep in your rv or at your hunting/fishing camp. Mundial is a world-wide leader in commercial knife manufacturing. Their products are used by some of the largest commercial food service chains and meat processing establishments. Polished steels keep your knife edge straight and sharp when working. Many times a knife will become dull due to edge roll, and does not need to have the blade ground, or resharpened. Used in many meat processing facilities. By taking a few swipes on the steel at the correct edge angle, while working, the edge will stay sharp longer.